With the Skrill VIP Program, you can get rid of almost all the fees you normally need to pay as a Skrill customer. Most importantly, you will be able to order and use the Skrill MasterCard completely free as a Skrill VIP customer. Your Skrill VIP status depends on the amount you transfer from your Skrill account to merchants, like Poker Sites, Bookies, Forex Brokers, but also normal online shops that offer the gateway of Skrill to checkout. You can see your current Skrill VIP level at the bottom of your Skrill account. 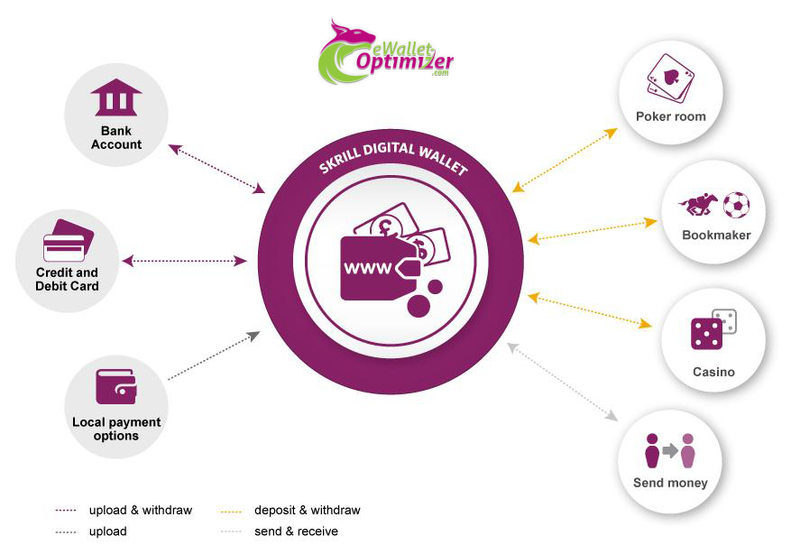 eWallet-Optimizer clients enjoy much lower VIP requirements to get upgraded to Bronze, Silver and Gold VIP. Submit your account details at your Skrill VIP upgrade page and we will check if we can get your account upgraded. By reaching higher VIP Levels, you will have lots of benefits, but the most important ones are higher transfer limits and lower FX currency fees. Skrill VIPs are also allowed to open multiple currency accounts and can order and use the Skrill MasterCard for free depending on the VIP level. All eWO clients will have much lower requirements to get upgraded to Bronze, Silver and Gold VIP. For Bronze you only need 3,000 EUR within 30 days to get upgraded, 5,000 EUR for Silver VIP and only 15,000 EUR for Gold VIP. 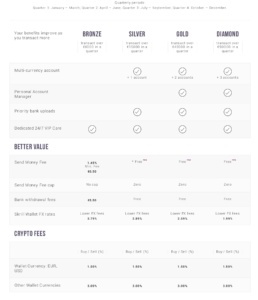 Compared to the regular conditions for non-VIP customers this is a huge benefit and you should make sure to apply for our free Skrill bonus program to not miss our fast VIP upgrades. * Please note, the lower requirements are an one-time offer for new eWallet-Optimizer clients. 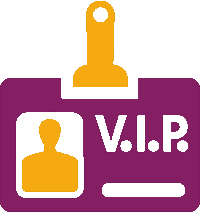 Once you have used our faster VIP Upgrade service you need to reach the standard requirements afterwards to maintain your status or to get upgraded again. There are 4 different Skrill VIP level you can reach. The more you transfer from Skrill to merchants, the higher your VIP status will be. 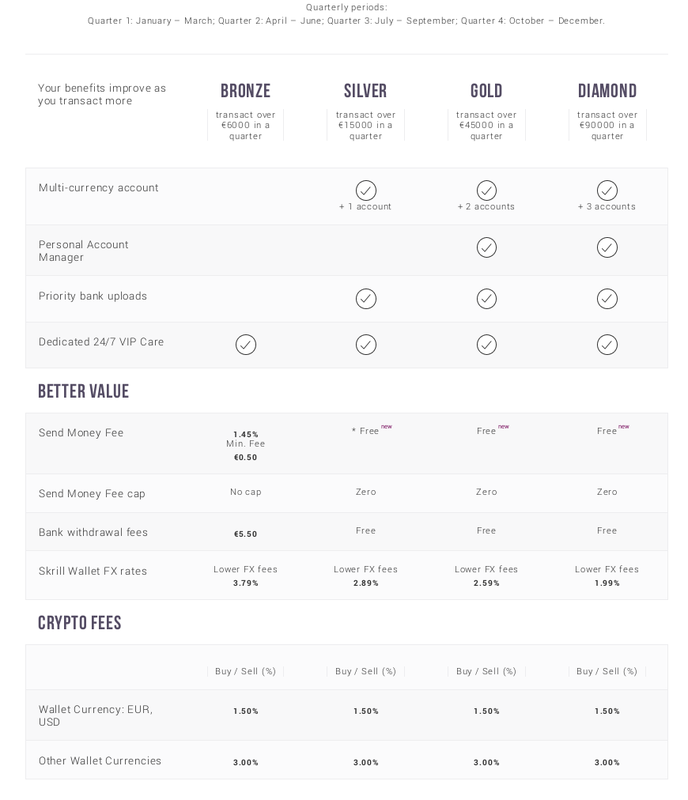 The main difference between the different Skrill VIP levels is the FX fee you have to pay for currency exchanges and the number of different currency accounts you can have. €6,000Transfer 6,000 EUR to merchants per quarter to reach bronze VIP Status. €15,000Transfer 15,000 EUR to merchants per quarter to reach silver VIP Status. €45,000Transfer 45,000 EUR to merchants per quarter to reach Gold VIP Status. €90,000Transfer 90,000 EUR to merchants per quarter to reach Gold VIP Status. Once you have reached the required transfer volume for the next VIP level, your account will be upgraded automatically within 24h. Your VIP status is calculated and adjusted every day. Your VIP Level depends on the amount you transferred from your Skrill account to all merchants within last 3 months. Please note that ALL transfers to every merchant count for the VIP calculation, even if they are excluded from the Skrill Loyalty Club. It is February the 15th and you want to reach Skrill gold VIP level. Go to your Skrill Transaction History and sum up the amount you transferred from November the 16th until today. If you reached 41,000 EUR (or the equivalent in your account currency), you need to transfer another 4,000 EUR to become Skrill gold VIP the next day. Please make sure not to fall beyond the required amount of 45,000 EUR to maintain your new Skrill gold VIP status. If you have not been a Skrill VIP customer before, our clients are able to join our special Skrill VIP Promotion. After opting into the Promo, you will only need 3,000 EUR transfers to become Skrill bronze VIP, only 5,000 EUR to become Skrill silver VIP and only 15,000 EUR to become Gold VIP. Please note that ALL transfers from your Skrill account to ALL merchants do count for the Skrill VIP status. To maintain the Skrill VIP status, to reach higher Skrill VIP level or to become VIP member after losing your status, you will need to reach the normal transfer requirements. For your eligible transfers you can earn 1% (up to 100 EUR Bonus) for your transfers to not-excluded merchants. This bonus is paid by Skrill and comes in addition to your monthly eWO Bonus. Please note, this 1% bonus can only be claimed by reaching the requirements within 30 days after your Skrill account was opened. Older accounts cannot participate! eWO Members earn a monthly Bonus on all their transfers from Skrill to any merchant. Please check our eWO Skrill Bonus Program for more information and make sure to check our Route to Skrill VIP for detailed instructions. Skrill VIPs enjoy a lot of benefits and can earn huge value for their transfers. In combination with our free eWO Skrill Bonus program you can become a VIP member even faster and also benefit from our monthly bonuses and personalized support. If you are interested in joining Skrill and want to become a Skrill VIP member faster, please proceed with our registration or contact us for any further questions.